Did you know that the plural of octopus is octopuses and that octopi is grammatically incorrect? That hasn’t stopped the word from creeping into popular usage. 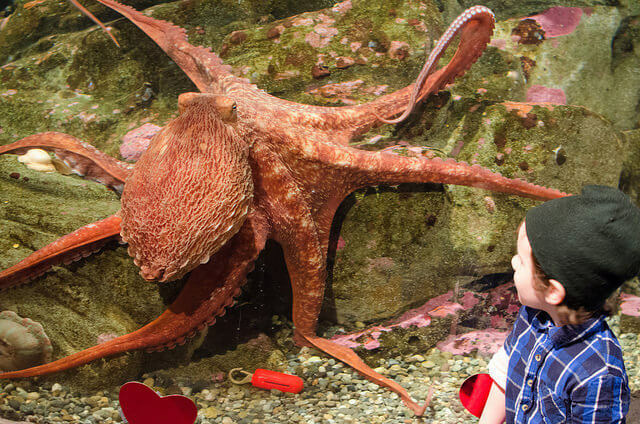 Speaking of creeping, did you know that octopuses prefer crawling over swimming because their primary heart (one of three hearts the octopus has) stops when it’s swimming? Here are 5 other fun facts you never knew about octopuses. … Unless they look. While the brain can control what the arms do, there is no path back to the brain for the octopus to know what the arms are doing or the size of their prey without looking. Despite having no sense of where its arms are and what they are doing, the octopus has an excellent sense of touch – the suction cups on its arms allow the octopus to taste what it is touching. 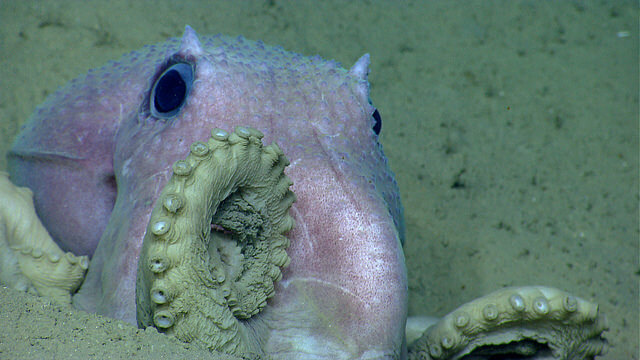 The suction cups also recognize octopus skin to prevent the arms from getting stuck to each other. They are arguably the most intelligent invertebrate on the planet. Problem-solving and maze experiments have shown evidence of both short and long-term memory. Octopuses can be trained to distinguish between different shapes and patterns. They may use tools – the veined octopus has been observed manipulating coconut shells to build shelters. Between their intelligence and their ability to squeeze through openings as small as an inch across, they can be extremely difficult to keep in captivity. Since they don’t have a protective shell, they hide in dens and bring their prey back there to eat. The den is often surrounded by dead and uneaten food items. Other creatures often share dens with octopuses, arriving as scavengers or after surviving capture. They prefer to hide in their dens or disguise themselves using camouflage and mimicry. They have special skin cells that allow them to change color to better blend in with their surroundings. They may also use this color-changing ability to communicate with other octopuses or warn predators away. Mimic octopuses use their super flexible bodies and color-changing abilities to resemble more-dangerous animals such as lionfish, sea snakes, and eels. Octopuses can also squirt out ink to confuse predators and give them a chance to escape. Some octopus species are able to self-amputate an arm, which is able to move on its own without input from the animal’s brain, giving a predator something to chase. The smallest species is Octopus wolfi. It’s about an inch long and weighs less than a gram (0.035 oz). 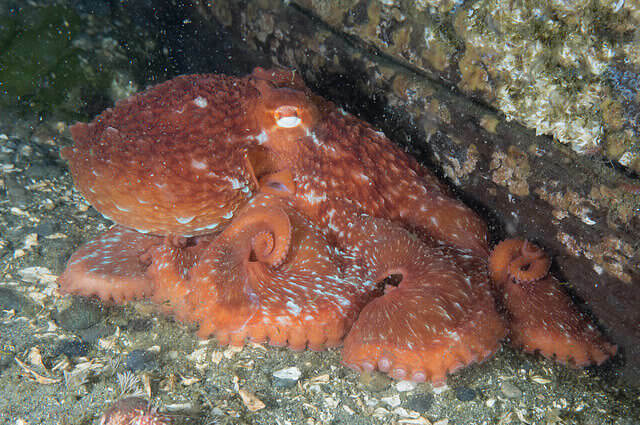 The giant Pacific octopus is generally considered the largest known octopus species, though the seven-arm octopus may be nearly as large. The Pacific octopus generally has an arm span up to 14 feet and a weight around 33 pounds, but some specimens have been observed with an arm span as long as 30 feet with a weight up to 600 pounds!